Spring is definitely on the way and I'm now thinking about packing away my dark sultry nail shades as the only thing I'm craving is brighter than bright shades on my fingertips. I've pulled out some of my favourite nail varnishes and shades that I'm itching to start wearing. 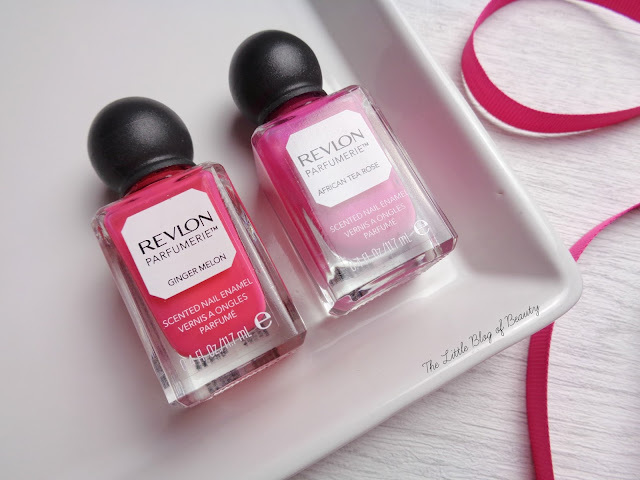 Although scented nail varnishes are a bit gimmicky I loved Revlon's Parfumerie range. The bottles are gorgeous and although the brush is a little on the thin side the formula is great so they're really easy to apply. The two shades that caught my eye the most were Ginger Melon and African Tea Rose, so I made sure to add both of them to my collection. Ginger Melon is a slightly orange coral shade and African Tea Rose is a fuchsia with a very very fine blue/pink shimmer that if I remember correctly doesn't show up well on the nails. I also have a shimmery blue shade but I find this one to be super sheer on the nails. These are £6.49 each but having just checked the Boots website I discovered both of these shades (and several others) were discontinued in August 2014. I didn't realise I'd had these that long! Illamasqua's nail varnishes are some of my favourites as they're so easy to apply and last really well on my nails. Their brushes are thicker than the ones on the Parfumerie nail varnishes but are still a little on the thin side. The fantastic formula makes them easy to apply though. Left to right we have Obsess (a purple pink), Collide (bright pink) and Harem (a cool lilac pink). These are a little pricey at £14.50 each (but they're worth it!) but you regularly find them in TK Maxx at the moment, usually for around £4. I think this is because they're currently clearing out their stock as there's only around half the shades they used to have on the Illamasqua website. I just hope they're planning to launch more. These also come right down in price when Illamasqua have a sale, so that's the perfect time to grab a few shades. Soigné is quite a recent discovery for me but I love their nail varnishes and my mum is also a big fan. 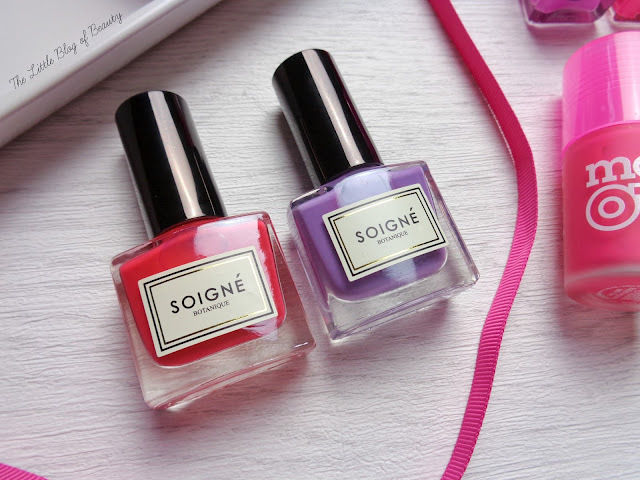 Soigné nail varnish contain up to 85% plant sourced natural ingredients and are five free. These come with quite a wide brush and as with the other brands I've mentioned so far they have a lovely formula making them very easy to apply. These can be a little thin but they dry quickly so it's not a problem to build up a few thin layers. Left to right these are Pamplemousse (a bright orange based red) and Kyoho (a dark lavender). These ones are £11 each (but again they're worth it) but Soigné often do sales where you can pick up shades for half price. In fact they just launched a sale yesterday, so get yourself over to the website if you fancy picking up a few shades. Next up we have the most budget option from my picks which is Models Own. Models Own nail varnishes used to be £5 each but I believe last year, maybe even the year before, they lowered their price to £4.99. I can't actually check this because the website currently has a holding page waiting for a new website. I'm not always a fan of Models Own's collections but the Neon one did catch my eye and I picked up Bubblegum, which is a really bright pink. This one has a fairly standard sized brush but I can't really remember what the formula is like. It can't be bad though as I've worn it several times. Finally there's piCture pOlish, which I'd wanted to try for ages and finally picked up a couple of shades last year. Of the two shades I bought I went for dark winter shade and then the summery Tingle, which is a minty green shade, greener than it has come out in my pictures. These ones come with quite a wide brush and are easy to apply. They range from £9.50 to £11.50 depending on the type (cream, shimmer, limited edition) and are a little hard to get hold of in the UK but there are a couple of official UK retailers listed on their website. What shades will you be going for in Spring? i can't wait for spring so i have been whipping out my bright nail polishes too. the revlon polishes look amazing. the packaging is a true winner. I looove the packaging of the Revlon polishes. I can't wait to get my bright pinks and pastel shades out for spring coming. Oh I love the packaging of the Revlon polishes!